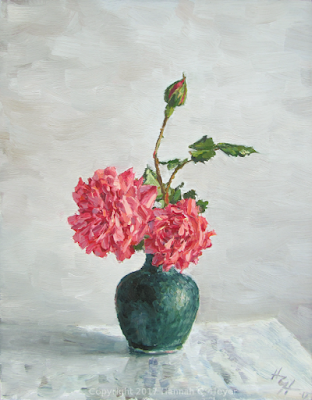 Autumn Roses, 9 x 7" oil on linen/birch. A stem of sumac leaves, with the light shining through them. 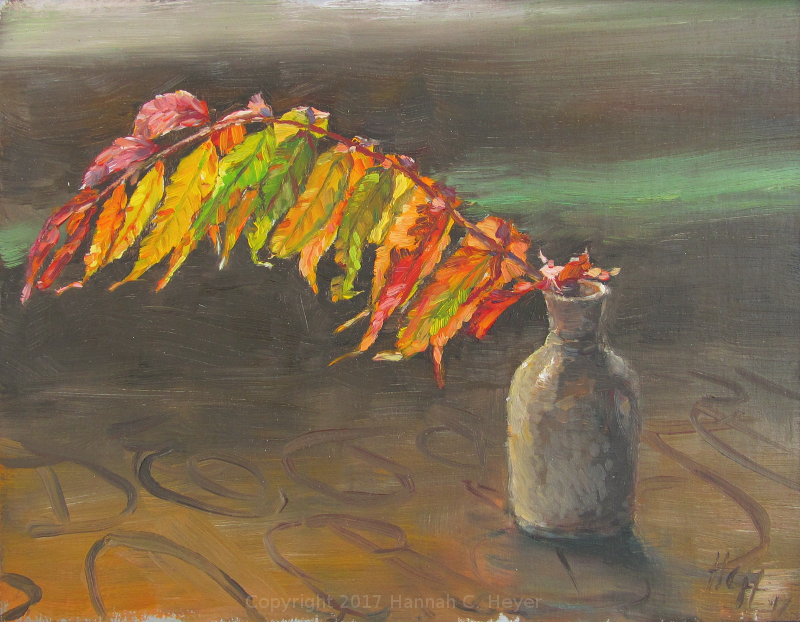 Sumac Leaf, 7 x 9" oil on linen/birch. Gathered hickory nuts from the woods. 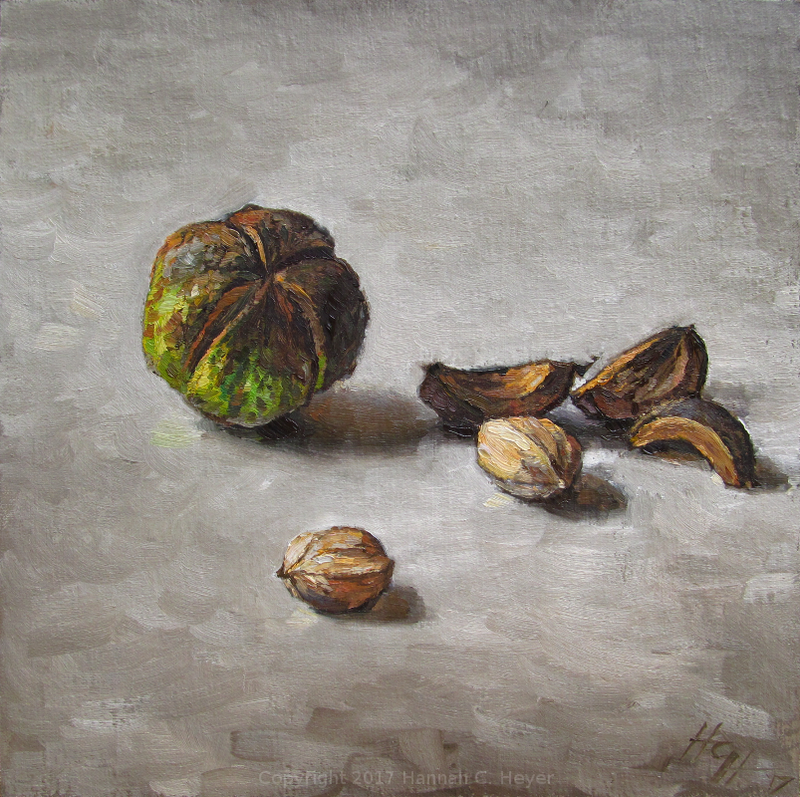 Hickory Nuts, 8 x 8" oil on linen/birch. A little study of autumn color, fields and pastures, and a few grazing cows. Green and Golden, 5 x 7" plein air oil on linen/birch. October 17, 2017. A blue-sky day along the river. Painted in Alma, Wisconsin. Followed by a cloudy one. 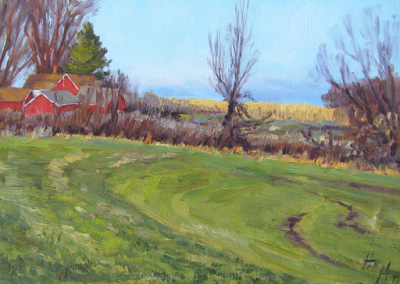 Painted in Brownsville, Minnesota. On the River, 6 x 8" plein air oil on linen/hardboard. October 20, 2017. 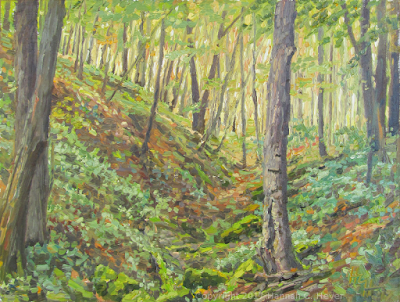 In a week's time most of the leaves in the woods were on the forest floor instead of in the canopy. 9 x 12" plein air oil on linen/hardboard. October 25, 2017. 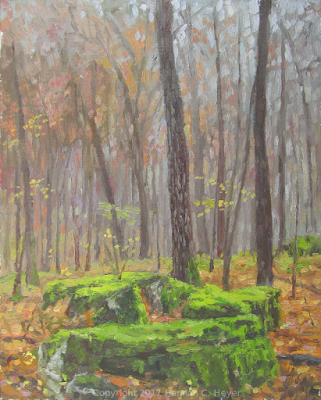 Falling snow and sleet softened the view of the landscape and heightened the color of the green moss and the dark trees in the woods. 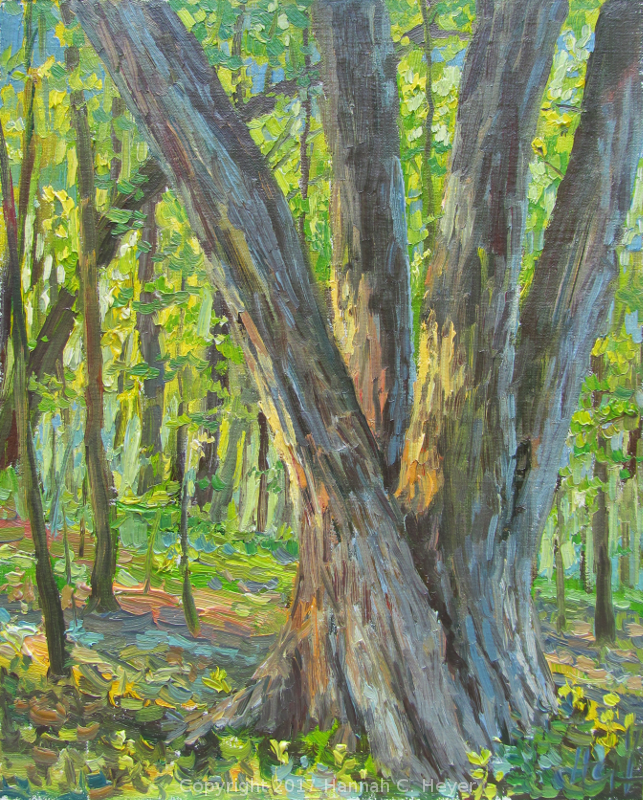 10 x 8" plein air oil on linen/birch. October 27, 2017. There is a particular row of pear trees in the orchard that always turns beautifully red in the fall. I broke off a few twigs before a hard frost robbed the leaves of their vibrant color. 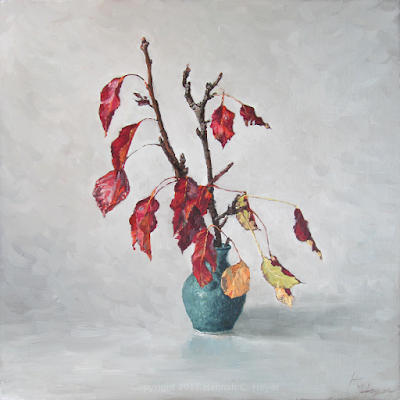 Pear Leaves, 12 x 12" oil on linen/birch. First snow. It didn't stick around long, but it was beautiful while it lasted. 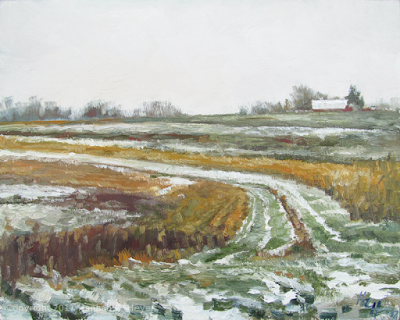 First Snow, 8 x 10" plein air oil on linen/birch. November 1, 2017. Another little still life of things gathered in the woods. Oak Leaf and Acorn, 7 x 10" oil on linen/birch. The last of the nasturtiums, which had been kept through a few frosts outside already. 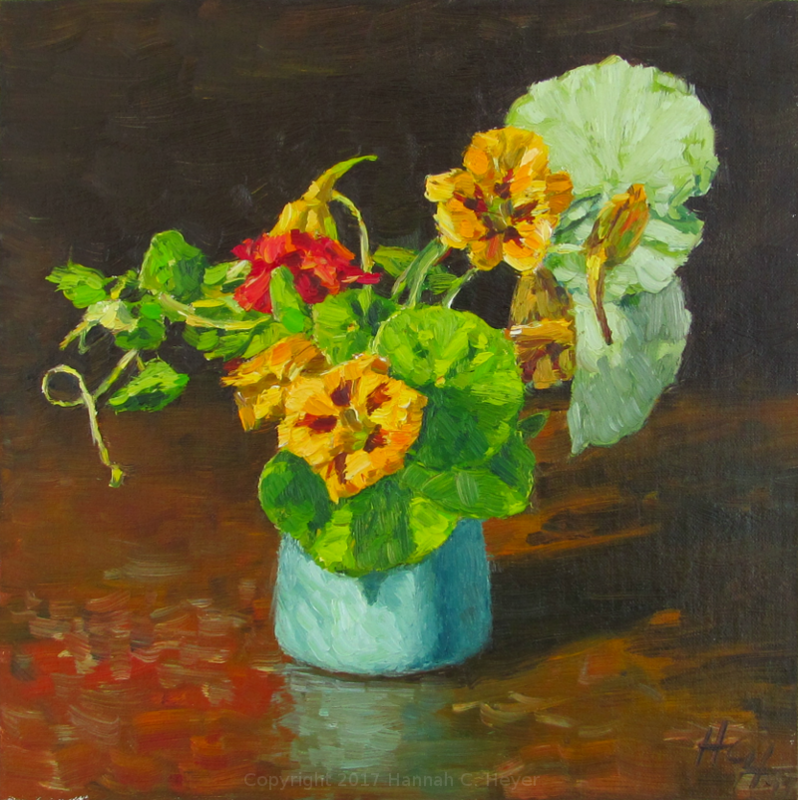 Nasturtiums, 8 x 8" oil on linen/birch. 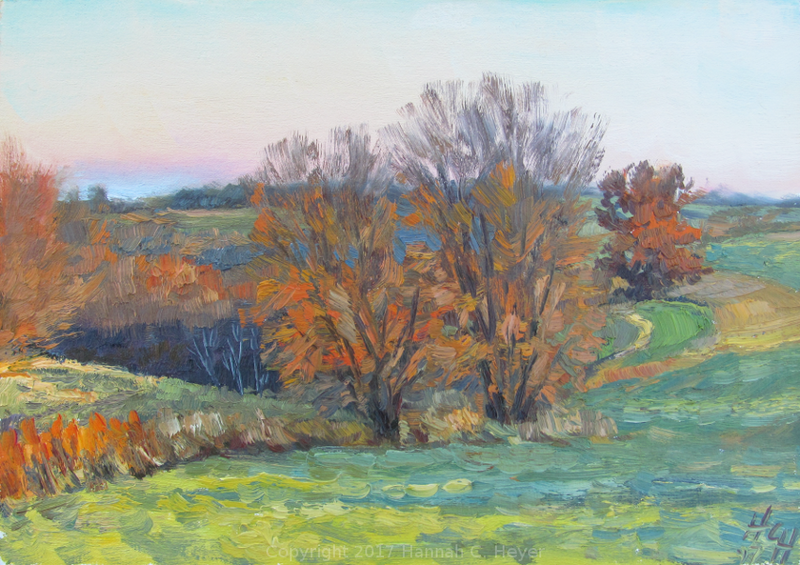 A quick study of the oranges and greens of a cold November evening. 7 x 10" plein air oil and linen/birch. November 9, 2017. 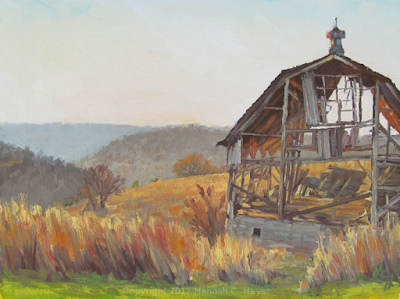 The old frame of a barn along a country road. 9 x 12" plein air oil on linen/hardboard. November 12, 2017. 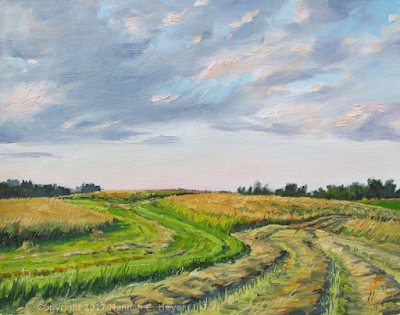 A study of the familiar sweep of the south-side fields on the home farm. The cold weather has changed the greens, softening and dulling their hues. 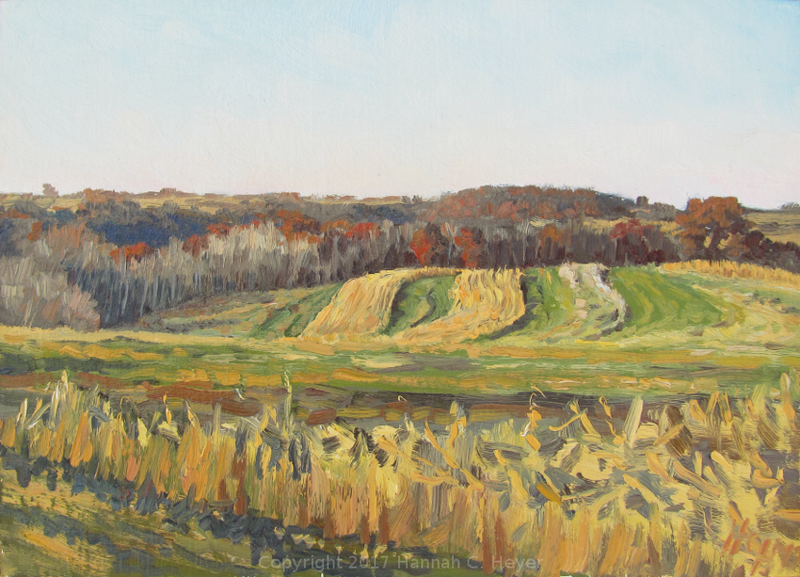 Windswept Fields, 9 x 12" plein air oil on linen/birch. November 13, 2017. 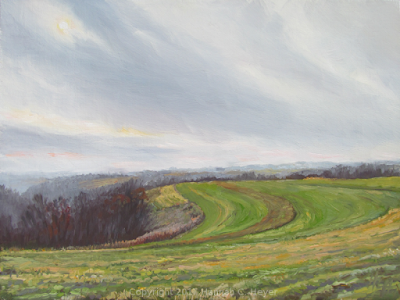 And a little study of the fields and woods to the north. The colors at dusk. 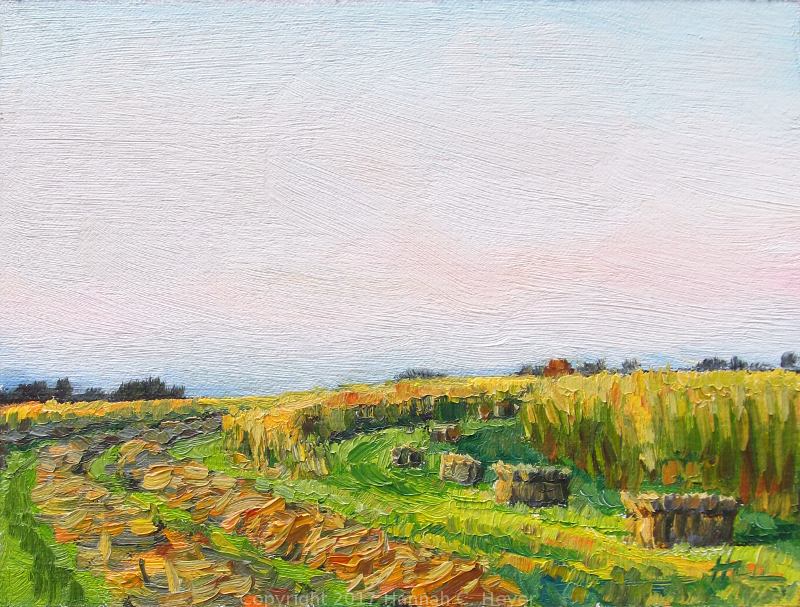 5 x 7" plein air oil on linen/birch. November 13, 2017. A sunshine day in a field of hay. 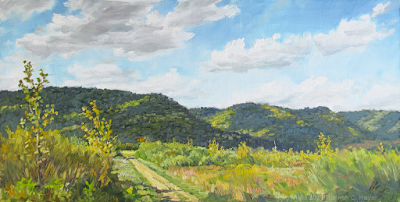 7 x 10" plein air oil on linen/birch. November 18, 2017. 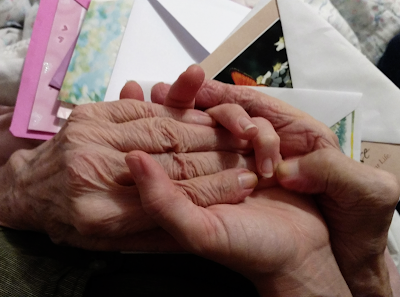 A day to give thanks. One among many. 7 x 10" plein air oil on linen/birch. November 23, 2017. Despite a stretch of warmer days, a little bit of ice remained on the shaded edge of the pond. 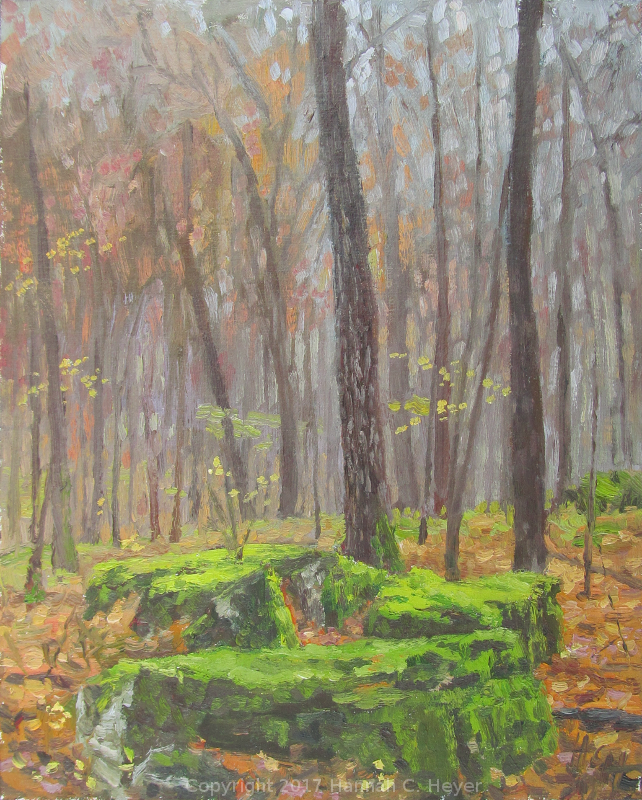 9 x 12" plein air oil on linen/birch. November 27, 2017. After keeping out during most of the deer hunting season, it was good to get back down amongst the trees again. 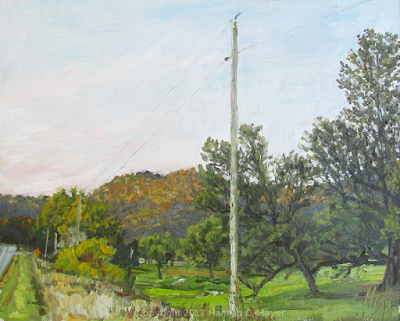 7 x 10" plein air oil on linen/birch. November 28, 2017. 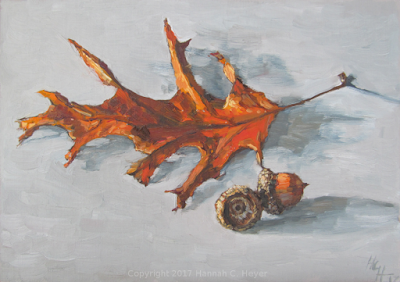 One more painting for the month of November. I knew just where I wanted to paint, and went there directly, but I didn't stay there after all. 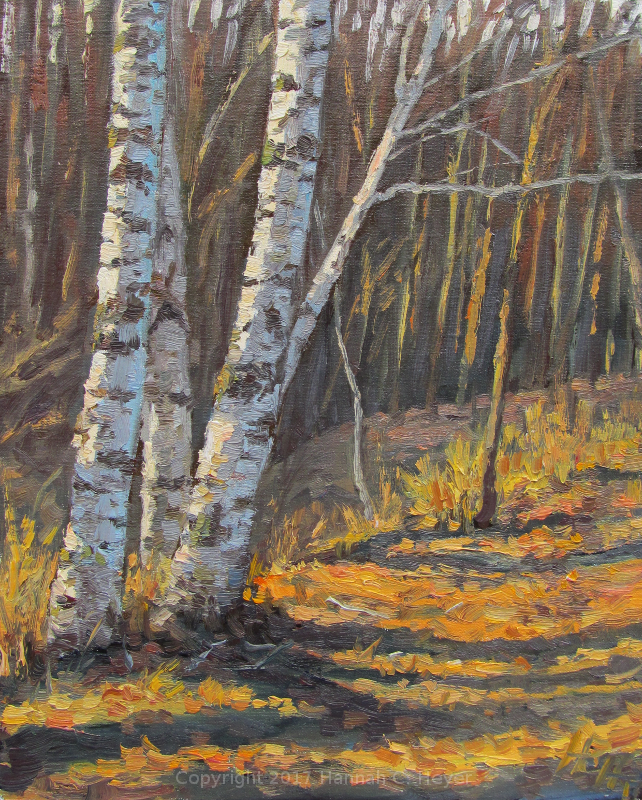 The old draw of the woods kept me wandering and meandering through the trees and up and down hill until the shadows were long and there was only just enough daylight left for an attempt at capturing this little group of birch trees. 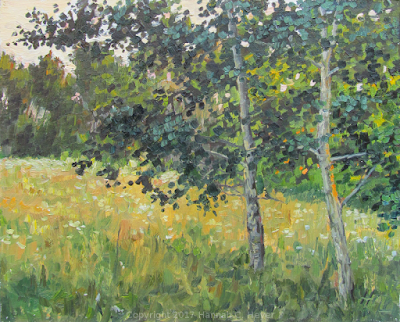 10 x 8" plein air oil on linen/birch. November 30, 2017. This first one was painted in Alma, Wisconsin. The trees near the water already showing their fading greens and hints of fall color. The weather that afternoon cycled through soft sunshine, rain, and gusts of wind. It was beautiful. 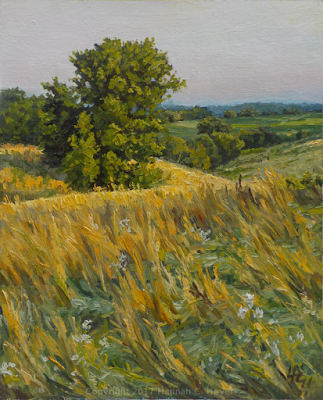 Evening on the Ridge, 8 x 10" plein air oil on linen/birch. September 8th. 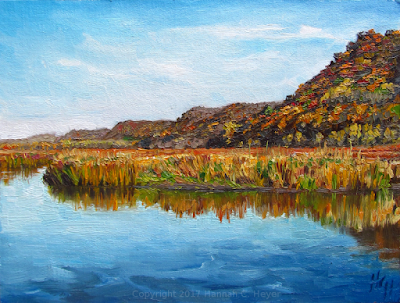 This little bluff and river painting was the first I did for the Between the Bluffs event, which is centered in La Crosse, Wisconsin. This was done across the Mississippi river on the Minnesota side, as evening fell. 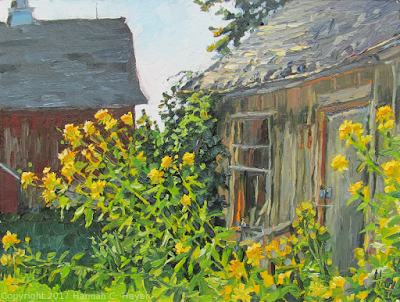 Worn Wood and Sunshine, 10 x 12" plein air oil on linen/birch. September 12th. 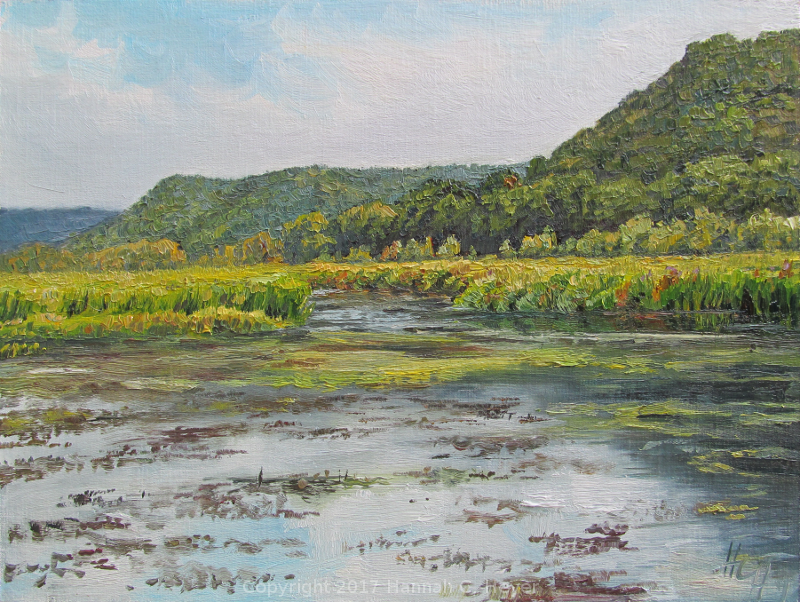 As part of the La Crosse event, I agreed to be one of the demonstrating artists - doing one painting at a set time and place for anyone who cared to watch. I'd not done this before, and frankly it can be a bit intimidating having people watch as the painting comes together! But it was fun; thanks to everyone who stopped over as I painted this beauty of an old barn. 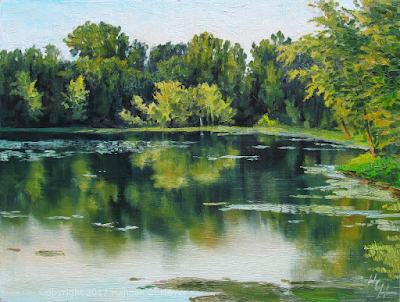 Then I had to take a break from painting for a bit as I finished up all the little and big things that go into preparing for an art fair. The Driftless Area Art Fair is a gem. Thank you to everyone who stopped by and made it so special! My booth at the Driftless Festival, day 1. 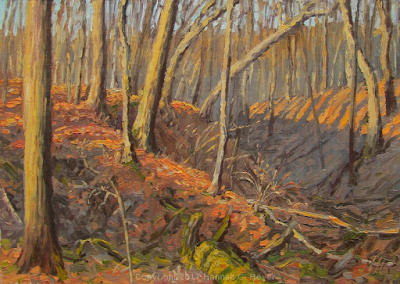 Shadows on the Bluffs, 8 x 16" plein air oil on linen/hardboard. September 19th. 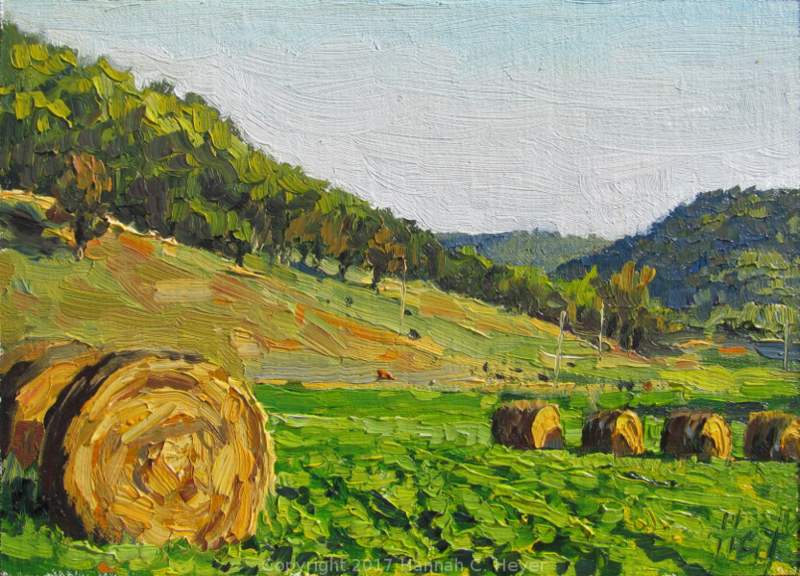 Down in the Valley, 8 x 10" oil on linen/birch. September 19th and 20th. I began this painting the same night, but it was late. I liked that color on the bluffs that were lit by the setting sun, but I just didn't have the time to get the painting to where I wanted it to be. The following night I returned to the same spot and refined it a little bit more. It was warm down in the woods and damp too, despite the dry weather. 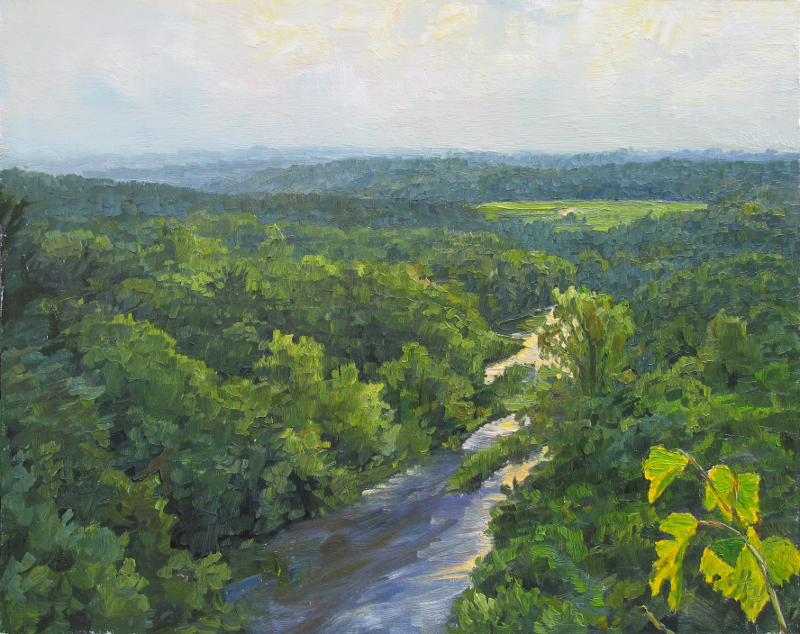 I had my easel wedged against a tree, with only its back leg set up, to keep it from sliding down the steep hillside, as I sought to capture the varying greens looking down towards the valley. 5 x 7" plein air oil on linen/birch. September 22nd. This last one was a little painting done for a couple who used to live in this area, but have moved elsewhere. I little reminder of the bluffs and valleys. I loved the light at that time of day! 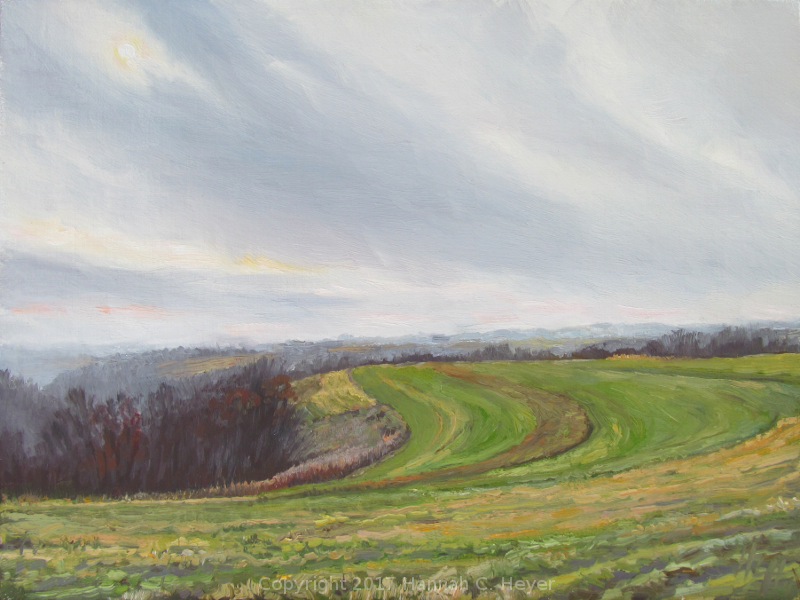 Three days in a row I went out to paint on a bale-strewn hillside with an excellent view of the western sky. Three days in a row the weather moved in from the northeast. The weather the first day was the most dramatic and severe. I caught the last of the sunshine and the beginning dark clouds in this little quick study. I finished up in between trips running up the hill to watch the sky and be amazed at the line of storm clouds and rain moving closer, lit dramatically by the light from the setting sun. 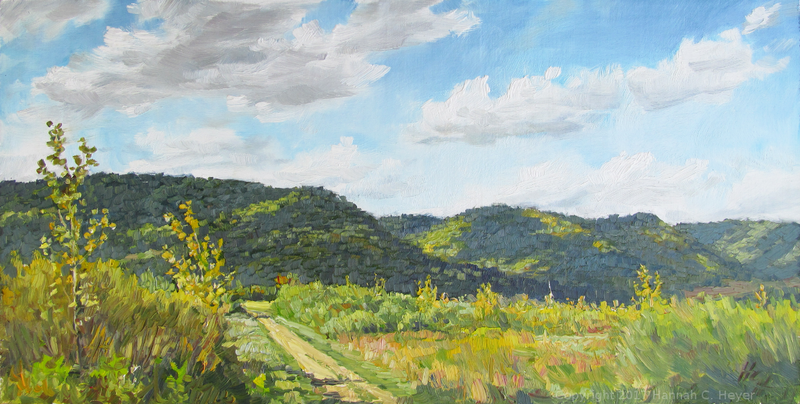 The next day I began a larger plein air painting - at 12 by 16 inches, it was a bit larger than I usually work outdoors. I got kind of a late start, though, and with the clouds which moved in once again it got dark sooner. I "finished" the painting, but I just wasn't satisfied. When we were kids, my older sister and I sometimes had the job of pulling wild carrot (Queen Anne's Lace) out of the pastures. It has a tendency to take over, so the goal was to keep it in check. 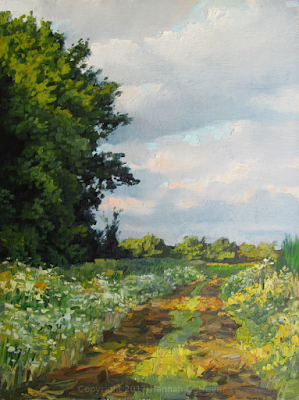 However, when roadwork was done nearby, and the mulch used to cover the bare banks and ditches was apparently full of wild carrot, the battle was officially lost. At least it's beautiful! 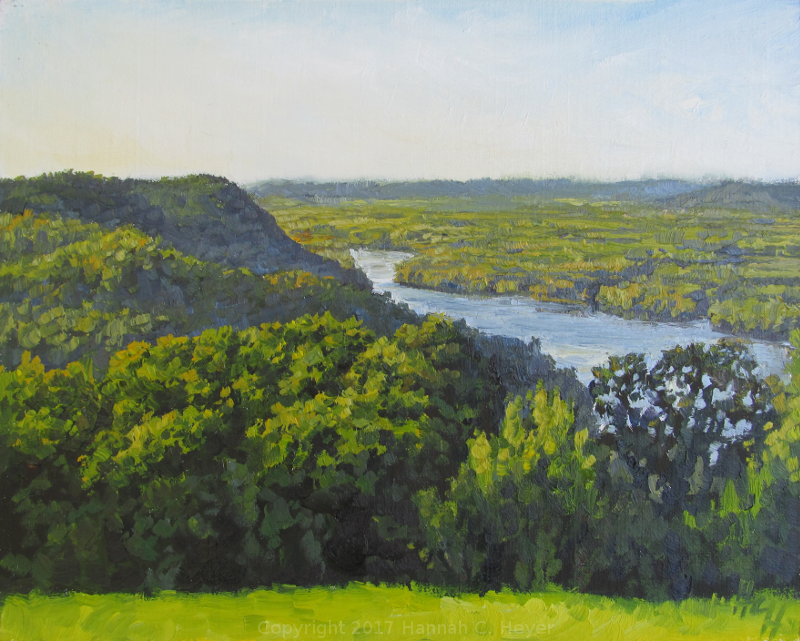 August 18-20 was the annual Plein Air Hudson in Hudson, Wisconsin along the St. Croix River. This year I wanted to check out the nearby state park: Willow River State Park. I'm so happy I did! The river it's named for is lovely, and the falls are understandably popular. 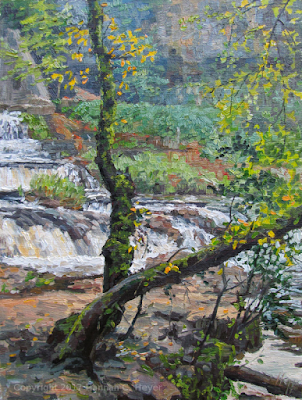 Friday the 18th was an overcast and cool day - perfect for hiking, and for taking my time on this painting of a couple of the trees that grow along the falls. Moss and stone and moving water. I definitely want to go back there. I spent some time in the afternoon exploring without my heavy pack of gear. Up a steep bunch of steps there's a nice lookout right up above the falls, and I wanted to return later and try a painting from there. 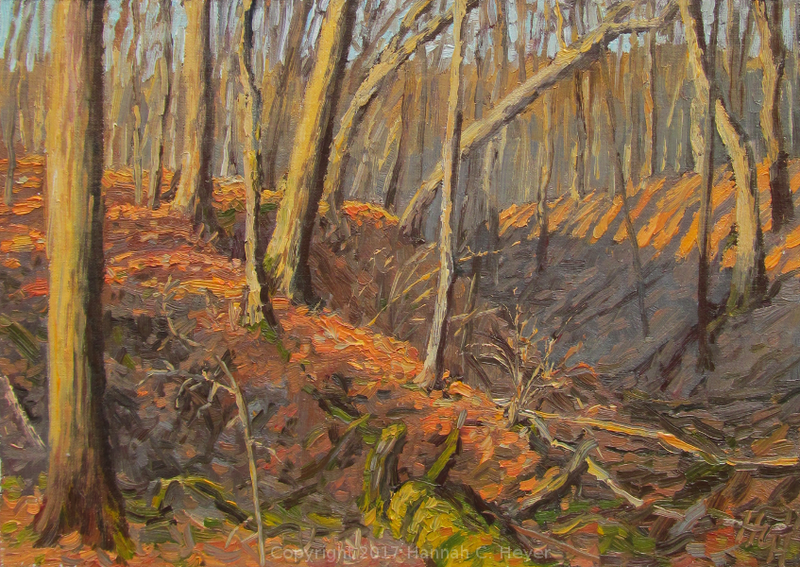 I didn't give myself much time - I used every bit of daylight, which made for a dark hike back - but the sun peeking out from the clouds and hitting the water and the colors and textures of the many trees and hazy hills was something I really wanted to capture a little of in my painting. Saturday, August 19th. 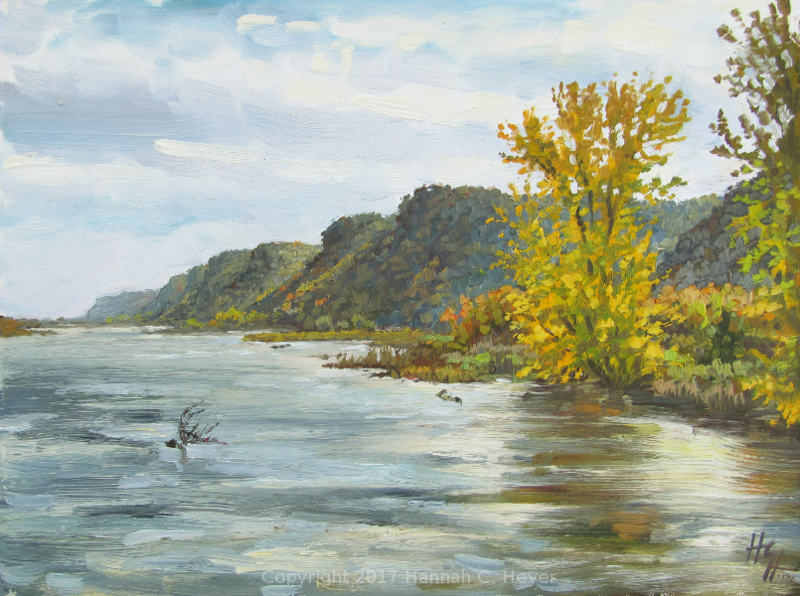 I spent the morning walking around the town of Hudson, and checking out the work of some of the other artists who were painting down by the river. I had lunch with a new painting pal, and then it was time to get to work! I saw this old brick building last year while walking around town and I wanted to paint it. It has a lot of character, and I really like its old door with its wooden slats. The view I first wanted would have involved standing in the street, which obviously wasn't going to work. So I got as close as I could, standing on the curb in the slim shadow of a power line pole. 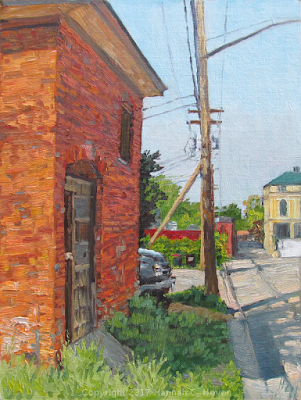 Light and shadow, green weeds and orange brick, and a view down the alley. In the evening I went back down by the water. The reflections on the still water were just magnificent, and I had to try to paint them. Sunday, August 20, back at the state park. It was a much warmer day than my first visit. Those steps up the trail seemed even steeper and longer! 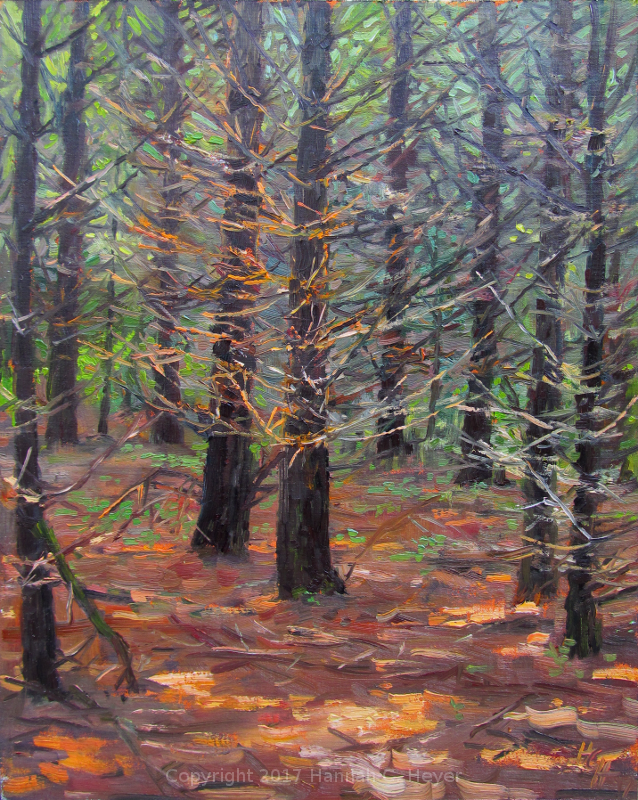 I don't often paint pine trees - I'm more of a deciduous tree person. But there's something so lovely about a pine grove, the ground covered in old needles, and the spicy-piney fragrance when the wind blows through it. 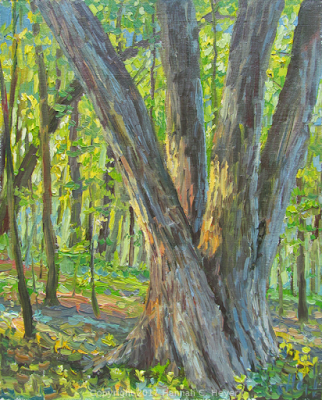 I liked how the light caught the bare lower branches of these trees and I wanted to convey that in this painting. 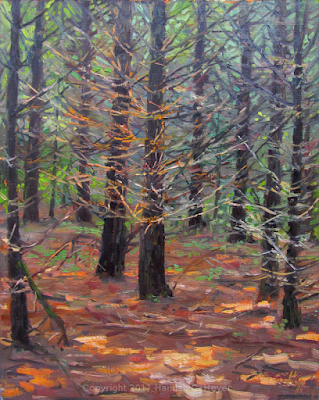 This painting came neither quickly nor easily; I have a lot to learn about painting pines. 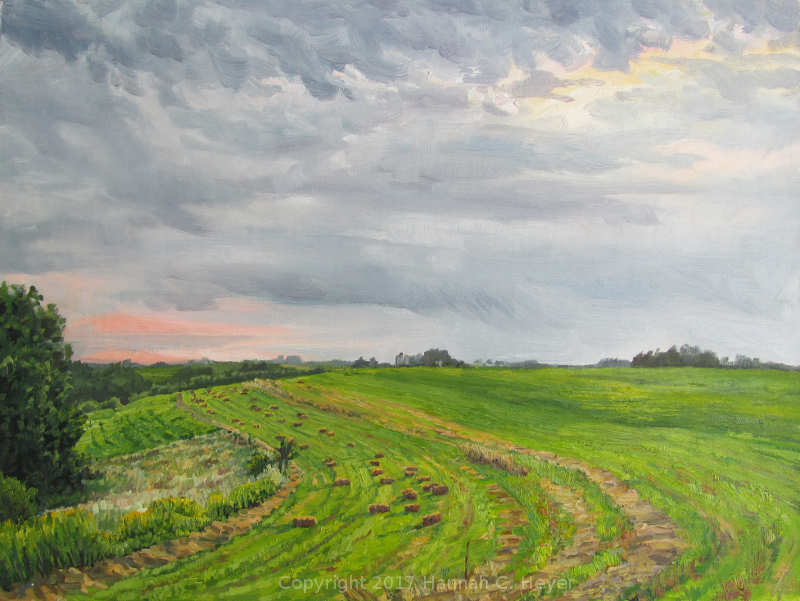 The last painting did go quickly - both out of necessity due to the time of day, and because it's more my usual subject matter: farm and sky. The sky was just getting interesting as the sun sank behind the clouds. I set up along this road and a corn field. A new road has gone in close by, and this one ends very abruptly just behind where I was parked. The evening of Monday, August 21st, held the opening reception. Really fun to see the whole show hung, pick out favorite paintings, and hear the stories behind some of them. The event judge this year was Scott Lloyd Anderson, and the top prizes went to Richard Abraham, Dan Mondloch, and Bob Upton, who well deserved them! 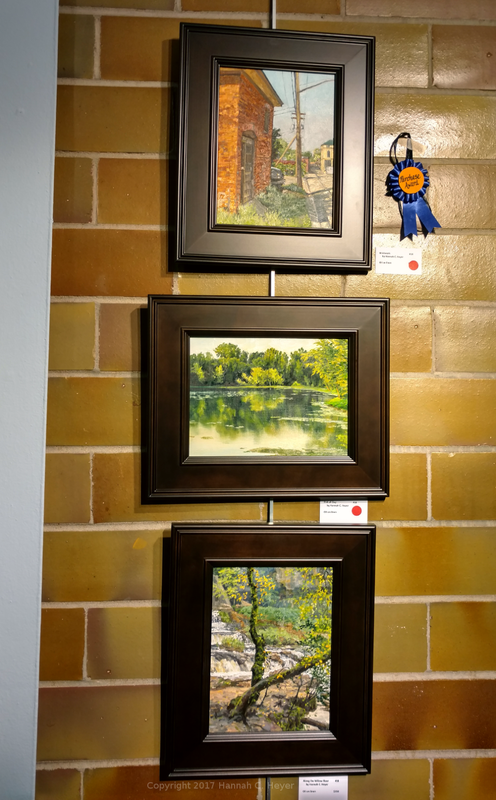 My three submissions to the show. 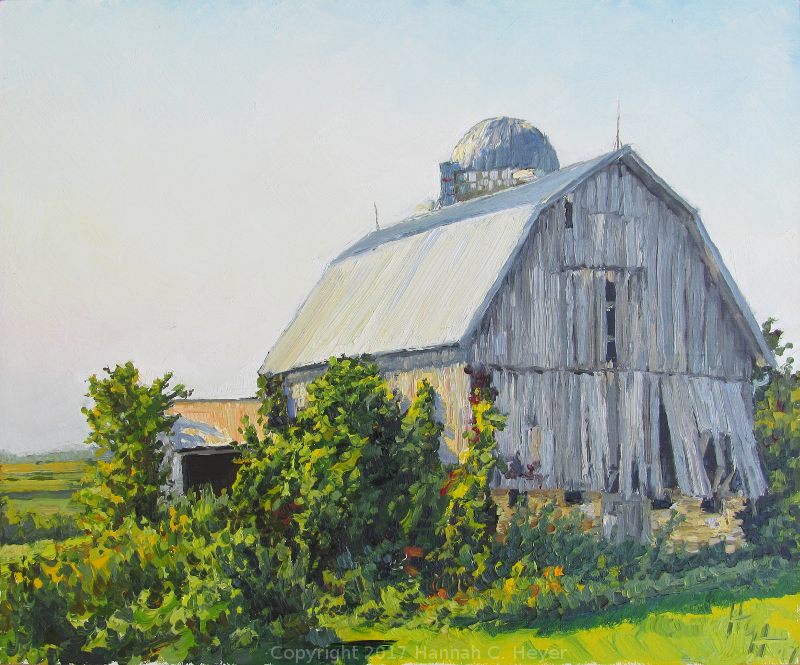 The show was on display August 21-27. Special thanks to all who stopped by, and extra special thanks to those who are giving some of my paintings new homes! Humid days and cut hay. Storms and sunshine. Thundershowers and wildflowers. 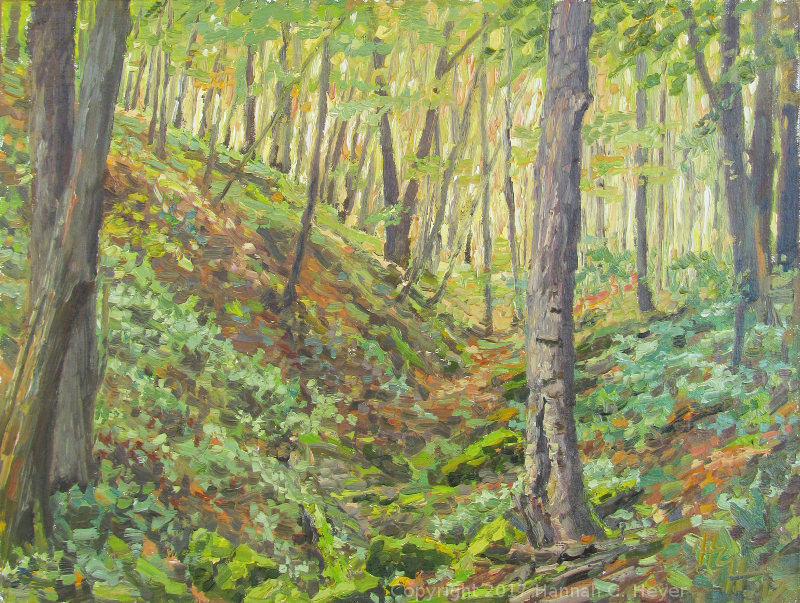 Evening Light, Northside Woods - 10 x 8" plein air oil on linen/birch. July 1st. It gets dark much sooner down in the woods, and I didn't start as early as I would have liked. But the light was so beautiful among the trees on this north bluffside. 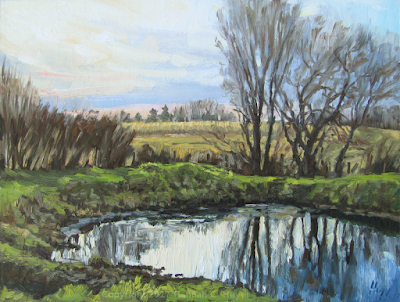 I painted quickly, trying to capture a bit of the late light before darkness fell, and the coyotes began to howl. July Hay - 6 x 8" plein air oil on linen/hardboard. July 5th. Another late evening start. 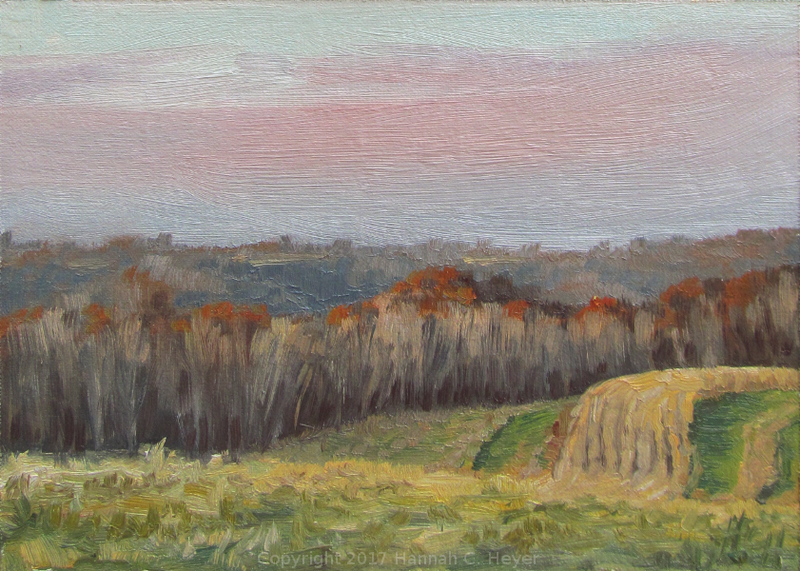 The sky showed pink, reflecting the colors of the sunset to the west, and the drying hay and small square bales caught the warm light. Hay Day - 11 x 14" plein air oil on linen/hardboard. July 7th. The weather looked uncertain - now dark and piling clouds, now sunshine. I set up with a good view of the sky in case it turned stormy. 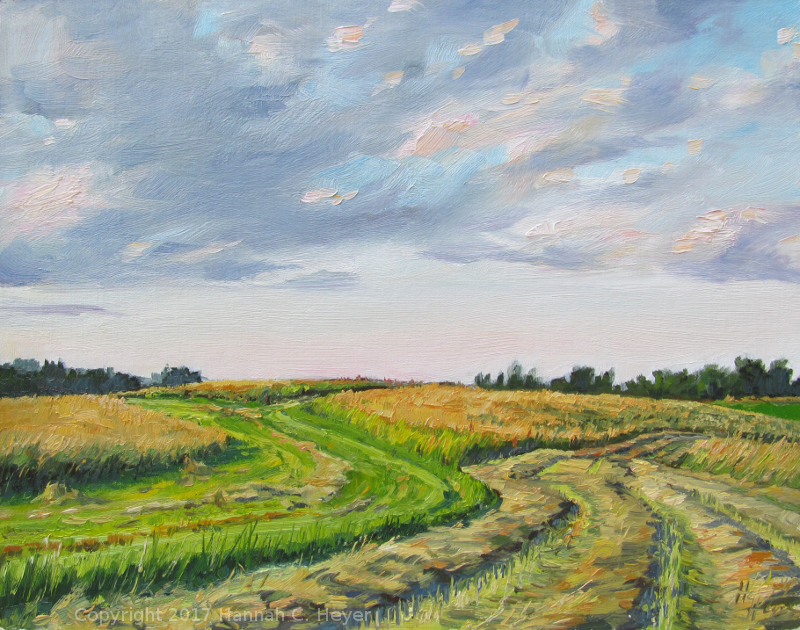 The patterns of the rows of hay and the contours of hillside fields are always beautiful to me, as is the fragrance of the cut grass, clover, and alfalfa drying in the heat of the day. 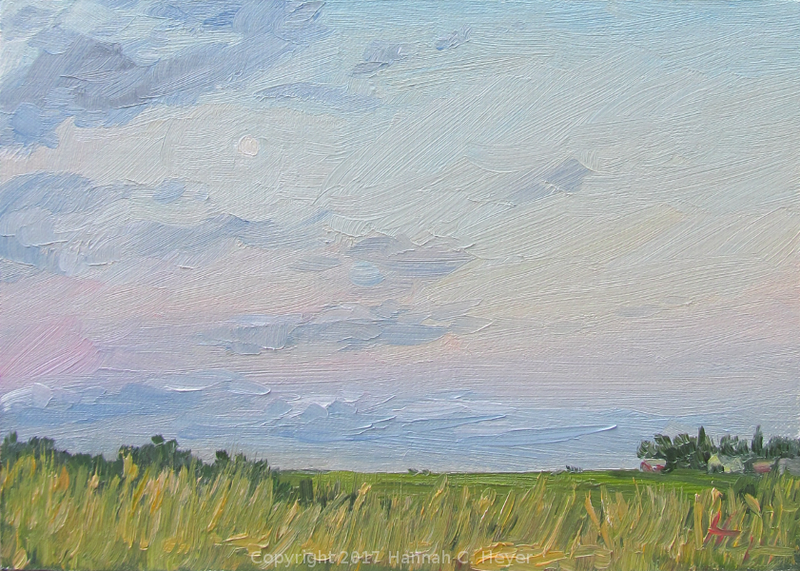 As I finished up, the clouds were breaking apart, and I did this little study of the moon rising in the dusky sky. 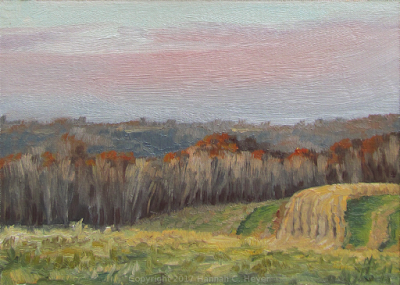 In the Still of the Evening - 5 x 7" plein air oil on linen/birch. 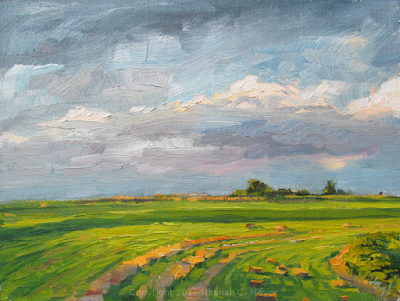 Between Storms - 10 x 8" plein air oil on linen/birch. July 20th. It was a warm, sticky evening. Patches of the long grass had been knocked over by the previous night's storm. I was surrounded by the sounds of tree frogs and the frogs from the nearby pond, and occasionally the sounds of startled deer. Everything was wet with dew as I finished up at dusk. 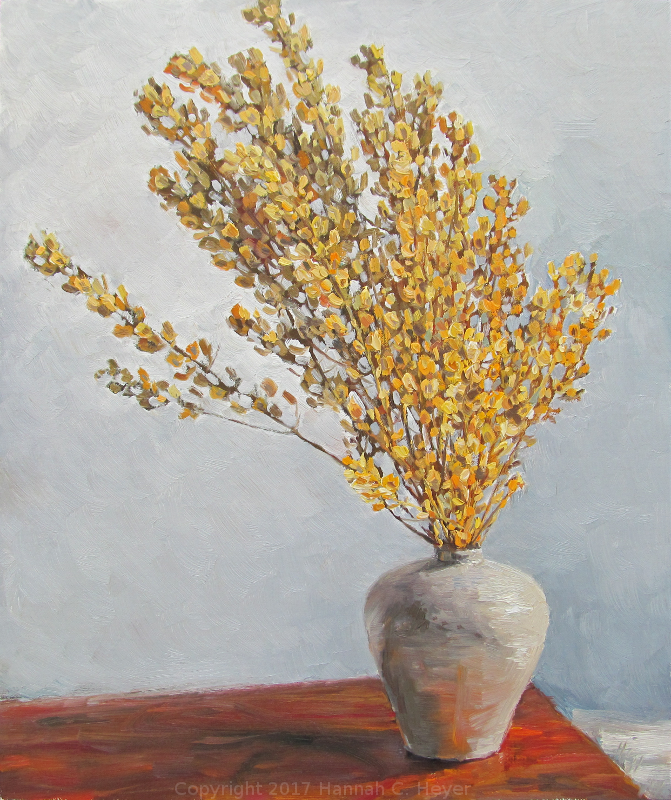 Pennycress - 12 x 10" alla prima still life. Oil on linen/birch. July 25th. Indoor painting day. I got this lovely vase from Cheesbro Pottery earlier this year, and it was perfect for holding a bunch of pennycress that I'd pulled out of the fields and that had dried, with its many seedpods arranged on its delicate stems. 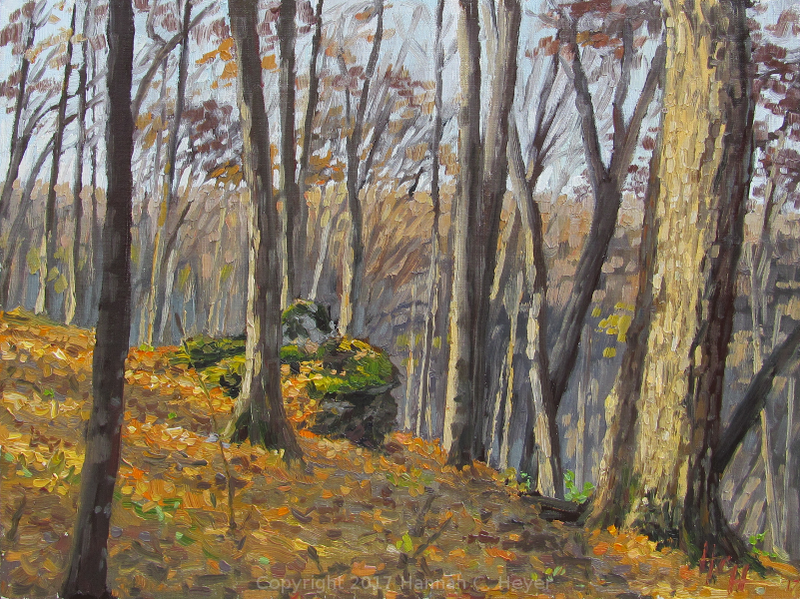 Old Gold - 6 x 8", plein air oil on linen/hardboard. July 27th. A little study of weathered wood and yellow blooms. I don't know what these flowers are actually named, but I always heard them called "Showers-of-Gold". They have been growing here for many, many years. The old building is the known as the summer kitchen, and has "1895" written inside the door. Old beauty. 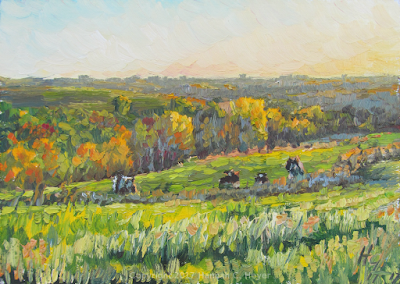 Poplars in the Pasture - 8 x 10", plein air oil on linen/birch. July 28th. Dusk in the pasture. Wild carrot and yarrow flowers, and two slender poplar trees. 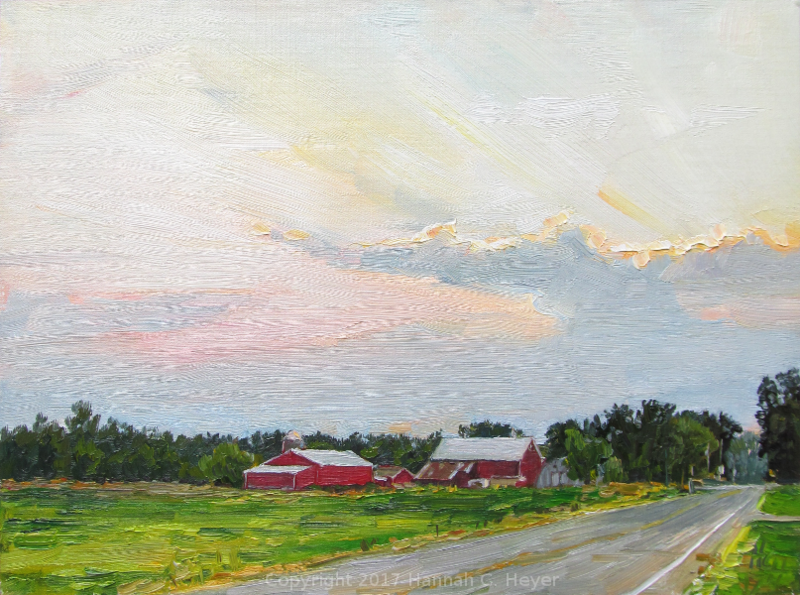 Pepin Cloud Study - 5 x 7", plein air oil on linen/birch. July 31st. Little studies of the sky, the bluffs, and the Mississippi River. The first was done in Pepin, Wisconsin. A warm breeze blew off the water, as the clouds shifted and made threats of rain on their way past. 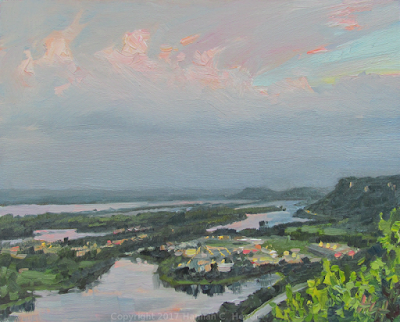 The second was done at the Garvin Heights Lookout in Winona, Minnesota. (A popular spot, it seems, for both man and mosquito!) It's a beautiful view over the city and the water. 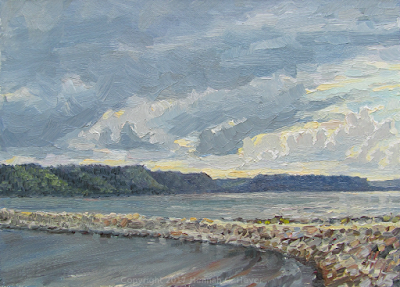 Though I'd planned to try a sunset paint, I instead faced the other direction, loving the mood and atmosphere looking downriver towards rain. 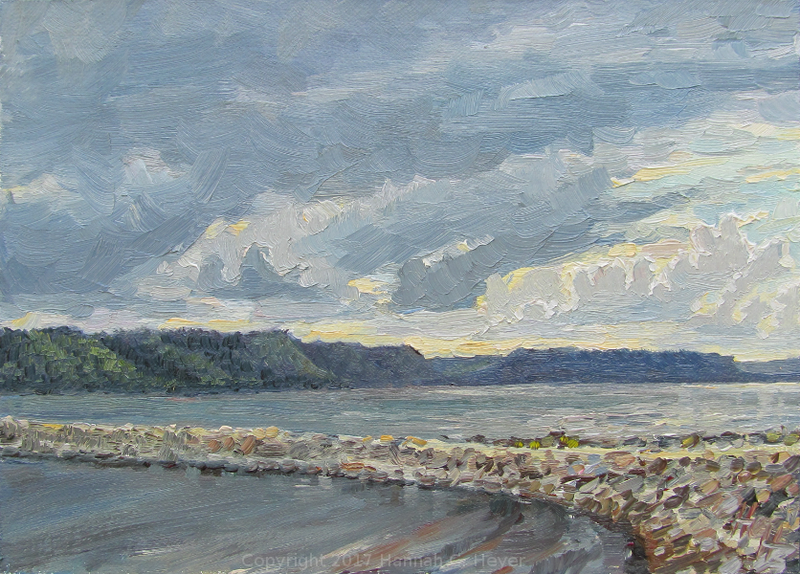 Rain Across the River - 8 x 10", plein air oil on linen/birch.